Should You Consider A Prenuptial Agreement? - Crooks, Low & Connell, S.C.
No one goes into marriage anticipating a possible divorce. And few soon to be spouses want to believe that down the road they may face legal claims and challenges that threaten their financial well being and the assets that they have spent years accumulating. The reality, however, is that many couples who are initially happily married will someday come to find that they are no longer the same people they used to be, that their needs have changed, or that it is time to move on. When this happens, particularly early in a marriage, individuals may be shocked to realize that the prospect of divorce can drastically change their financial circumstances in a matter of a few months. One way to reduce the threat of the financial unknown in divorce is to consider the possibility of a prenuptial agreement. Prenuptial agreements can be a very financially prudent decision where two spouses come into a marriage with very different financial positions. During a divorce, couples must make a full accounting of their financial assets and split those assets up between the two partners. Because Wisconsin is a community property state, marital property in Wisconsin is generally divided between a couple equally by default unless the parties have previously specified otherwise. 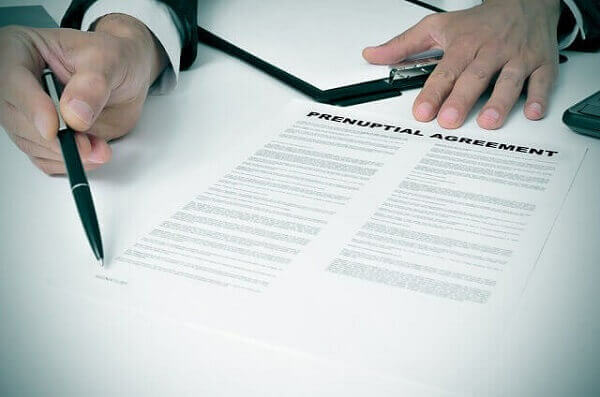 A prenuptial agreement is a way of specifying how assets should be divided in a divorce.. A prenuptial agreement is a contract that both spouses sign which sets forth how assets will be divided in the event of different scenarios such as divorce or separation or death. The prenuptial agreement can specify certain assets that either party may be entitled to, certain financial resources that the parties agree should stay with the spouse who brought them into the marriage, and even provide for different divisions of assets dependent on the length of the marriage. For example, a prenuptial agreement may initially provide that in the early years of a marriage, each spouse keeps primarily what he or she brought into the marriage, and the remaining assets acquired over marriage are divided equally. However, the prenuptial agreement may also specify that over time, as both parties devote energy and attention to the marriage, more and more of their assets should be treated as both of theirs, and divided equally accordingly. What Can A Prenuptial Agreement Cover? A prenuptial agreement can cover almost anything two spouses can think of with regard to finances and assets. It may set out each party’s right to their partners property from the get-go before entering into a marriage, or may simply direct the parties about how property should be split in the event of divorce. Prenuptial agreements may create legal mechanisms for holding certain finances or property during a marriage, such as creating trusts for the benefit of one or both spouses. They may also direct how certain property should be managed, such as requiring that neither spouse sell certain assets that a spouse may have an emotional attachment to. Finally, prenuptial agreements can also address questions of spousal support in the event of divorce. They can preclude spouses from receiving support from the other, set a cap on the amount of support that can be received, or set forth specific calculations for determining support that may differ from those traditionally employed by the courts. To the extent that either spouse has financial or practical concerns they want to hash out before entering into a marriage, a prenuptial agreement can be a vehicle for doing so. There are two important areas that prenuptial agreements cannot cover, however. They cannot address issues of child custody or child support. Prenuptial agreements cannot limit the amount of support that will be given to children in the event of a divorce because the right to that support is held by the children themselves, not the parents. Similarly, because child custody must be determined through a judicial consideration of what is in the best interests of the child, Wisconsin law holds that parents cannot predetermine child custody arrangements through a prenuptial agreement. Who Benefits the Most From Prenuptial Agreements? Whenever a couple comes into a marriage with different positions, or significant life experiences that have contributed to the acquisition of substantial assets, or the lack thereof, having a prenuptial agreement can be very important. If you are considering the possibility of a prenuptial agreement before marriage, it never hurts to learn more about the finer details of an agreement and evaluate how it may be of benefit, or hindrance, to you. There is a lot of misinformation and misunderstanding around prenuptial agreements, and speaking with an attorney can help to clear up questions you may have. At Crooks, Low & Connell, P.C, our family law attorneys can walk you through your options for crafting a prenuptial agreement that protects your interests, and help you determine how to incorporate necessary concerns or address lingering conflicts. For more information, or to schedule a consultation, contact our Wausau, WI offices online or at (715) 842-2291.